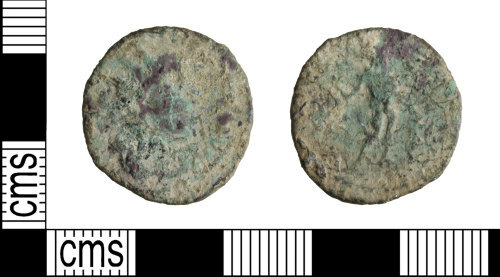 A copper-alloy Roman radiate of Victorinus, dating to the period AD 269-271 (Reece Period 13). VIRTVS AVG reverse type depicting soldier standing right, holding vertical sceptre and shield. Gallic Mint I. Cf Normanby 1422. Reverse description: VIRTVS AVG reverse type depicting soldier standing right, holding vertical sceptre and shield.